John B. Gordon (1831-1901), Major General, CSA (GA). Sharpsburg (WIA), Chancellorsville, Gettysburg, Wilderness, Monocacy, Cedar Creek, Appomattox. 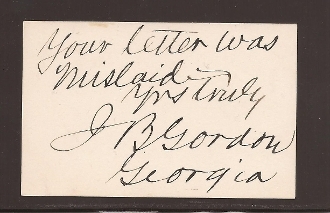 Card Signed with state (Georgia), sentiment and notation "Your letter was mislaid".